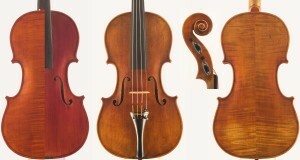 We have a select supply of quality vintage violins and violas. Most of these instruments have been thoroughly restored by myself or by other luthiers to be the best instruments they can possibly be. 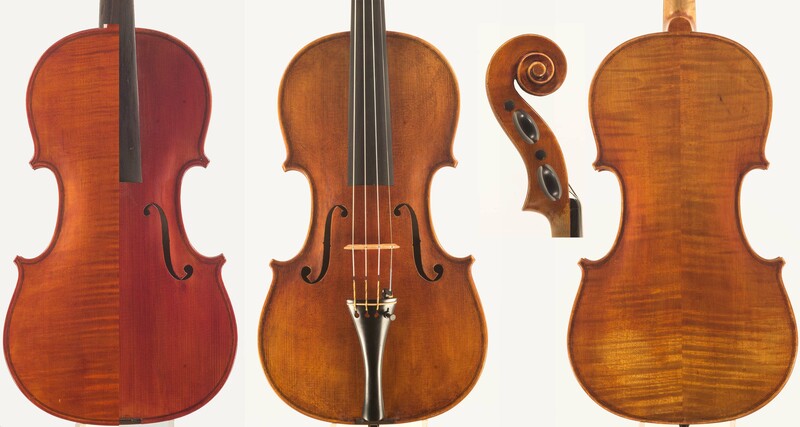 For the most part, vintage violins and violas from France and Germany begin at $2500.00, with some exceptions for especially good sounding older, lower grade instruments. Some shops will sell old instruments that are in bad structural or cosmetic condition for a low price simply because they sound good. I believe this practice is counterproductive to one’s long term reputation, so I avoid it. It is my belief that you will find a better value below $2500 in a recently made instrument. Beyond that price, older is very often better. Text continues after instrument descriptions. Click on the thumbnail and bring up the photo. There are thousands and thousands of violins with “HOPF” branded on the backs directly below the neck, and the majority of them are low grade junk. That said, many of them are fine instruments made by recognized members of the Hopf family and are labeled accordingly. It is unfortunate that this instrument is missing its original label, so I have no idea which member of the family made it; however it is a fine instrument featuring quality materials and meticulous workmanship in addition to very fine sound. If anyone who sees the photos can identify the maker I would appreciate a call. Sometime in the dim past I bought 6 beautifully made and horribly varnished violins from Eastman Strings with the idea that I would “improve” them by regraduating and revarnishing them. So far this is the only one I have completed (so much for “best laid plans”). I stripped the wretched finish off about 10 years ago, and then I promptly put it aside. Last June I finally decided to give myself a week to finish the job. I had the idea that I would play it at a music festival on the week from Friday. On Wednesday I took it apart and began the graduating process–ribs, back, and top. On Friday I installed the bassbar and completed tuning the top and back; then I glued on the back. Saturday found me gluing on the top, and when the glue was dry I began cleaning up the edges and corners and thinning the neck. It was obvious to me that the the red color had penetrated too far into the top to get it out, so after I sealed the instrument I decided to stain the whole body a medium brown color. Monday was spent applying color and varnish, and it was left to dry out for another day before any more varnish was applied. By Thursday the finish was hard enough, so I glued on the fingerboard and set up the violin. The next day I went to a music festival, and it was this violin that I played all weekend. The photo shows a similar instrument on the left where you can see the contrast between the color of the top and the back, and to the right we have the finished product. This violin has a great sound and it features very high quality wood and a minimal amount of varnish. 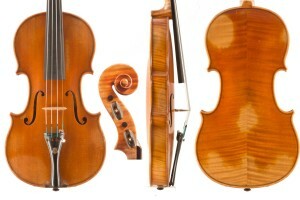 A terrific first “good” violin for an advancing student or a second instrument for a professional. In 2001 a very nice lady brought this instrument to me for repair. It had a small crack in the top, a bad fingerboard glue job, and not much sound. Since I had to open the instrument to properly repair the crack, I noticed that the top, back and ribs were far thicker than they needed to be. The owner agreed to my suggestion to properly graduate the instrument and to replace the bassbar. When the job was completed she was delighted with the improvement in volume, tone, and playability. 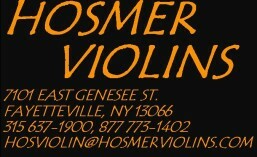 Alas, now she can no longer play due to advanced age and physical disability, so she has entrusted her instrument to Hosmer Violins for sale. Reinhold Schmidt operated a large workshop in Markneukirchen, at its peak in the two decades before WW II. 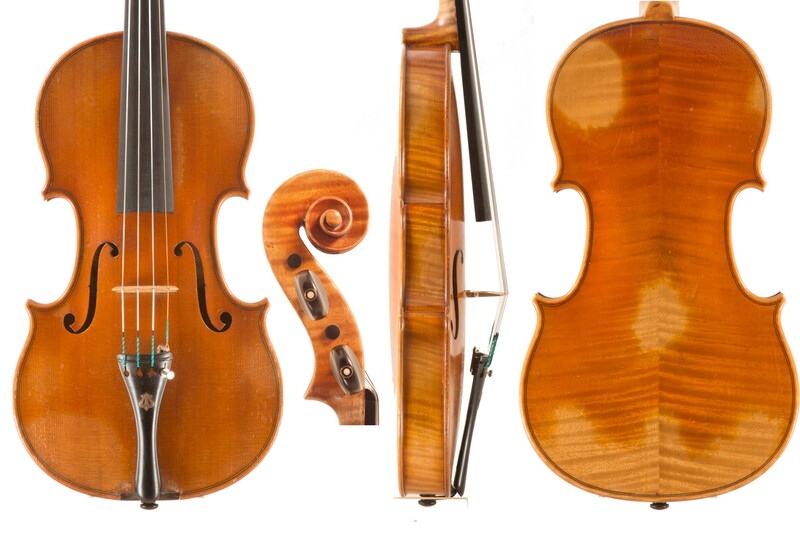 This violin is one of the highest grades they produced with the finest wood and workmanship. 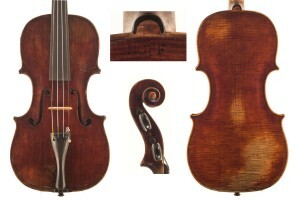 With all original varnish and fittings this violin is a stellar example of the best of twentieth century Markneukirchen. After many years of storage or disuse, vintage instruments often need a significant amount of work. The higher quality items are well worth the investment in time and materials. This is the area where the great Markneukirchen and Schonbach (both German) violins from 1880 to 1940 are found. Also in this category are violins from Mirecourt (France). They feature terrific wood and workmanship. Unfortunately it’s in the wood where the problem lies: there’s too much of it. For whatever reason, the average Heberlein or E.H. Roth violin is twenty to forty percent too thick, and the necks need to be cut down to the proper size. This is a time consuming process because what we are doing is completing the job that the original makers started. And don’t think for a minute that we are altering an original work of art. As Hans Weisshaar said in his book Violin Restoration, they could have been “sold more advantageously by the pound than by the sound.” These instruments are the 1930’s versions of the semi-mass-produced “intermediate instruments” described elsewhere on this site. That’s what they were then. Today the quality of the wood, the varnish, and the workmanship make them much more. In order to enhance the sound, we also need to bring the instrument to the best possible structural condition as is possible. We stand behind what we sell, and to do this with older instruments we have to make sure that there will be no problems. Besides conservatively graduating the plates to normal thicknesses and replacing the bass bar, the neck is often removed and reset, peg holes bushed, fingerboard replaced, cracks artistically repaired, edges replaced, varnish retouched, etc. Instruments much more than 125 to 150 years old have many more restoration issues than described above. Not all instruments of that era need that amount of work—there are many that only need to be cleaned and set up. Sometimes we get lucky. The potential quality determines whether it’s worth it to perform what amounts to $1500 to $3000 of work on an instrument. The quality of today’s instruments has already determined that a whole class of instruments that sold for $500 to $2000 twenty years ago no longer measure up to the current products. So as I have said many times in the past, it is unusual to find a good looking, good sounding vintage violin for less than $2500.00. 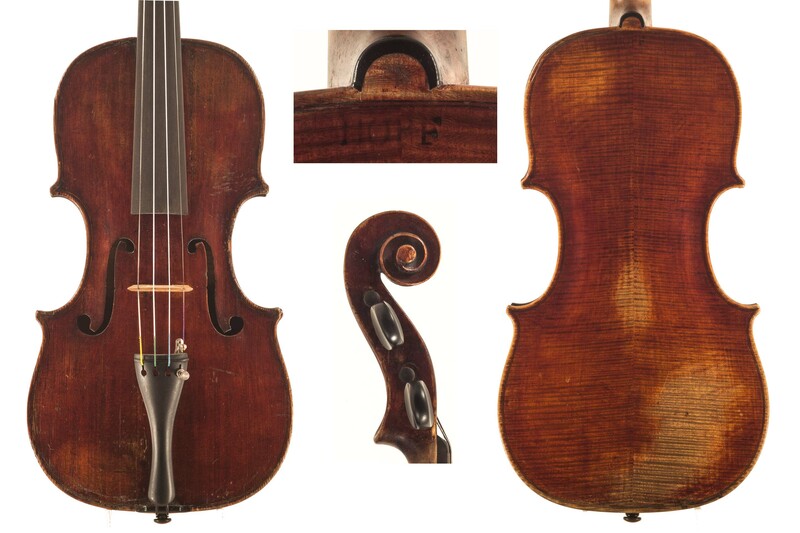 The average price for a typical pre-war Markneukirchen, Schonbach, or Mirecourt violin that has been “brought up to speed” is $3000 to $5000, with the more desirable “name” instruments, like high end Heberlein’s and Roth’s, thousands more. Let me make one thing clear: it is never permissible to alter the graduations or to remove original varnish on an instrument that has been made by an individual master maker. The instruments described above were still semi-mass-produced, just at a much higher level and with higher quality wood than what we see today. And we haven’t even approached the level of what fine professional-level vintage instruments can cost, and how much it can take to restore them for modern playability.